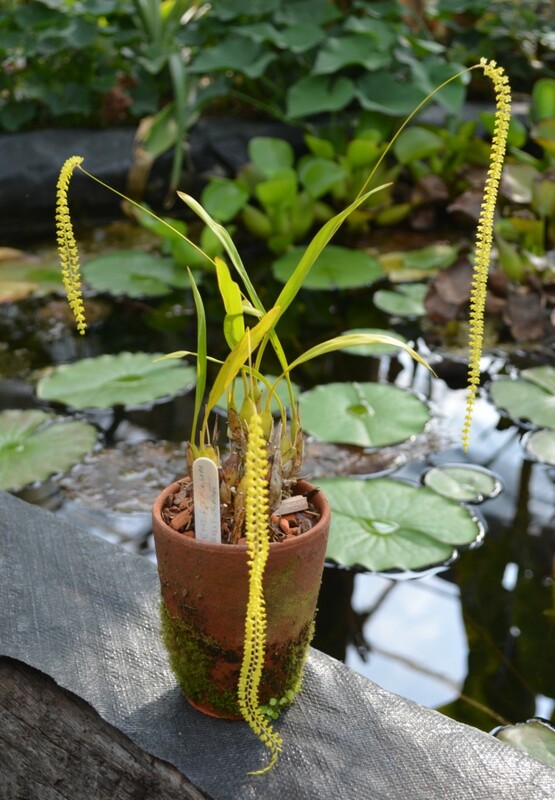 The plant of Dendrochilum filiforme in the tropical glasshouse. This diminutive orchid is commonly known as the Golden Chain Orchid, a name it shares with a few close relatives. The plant in our glasshouse was donated by a keen plantsman who grows a range of exotic species and is now flowering for the first time. The small plant arrived in late summer 2013 and was potted in a mix of equal parts Seramis: Orchid Bark: Sphagnum in a clay pot, and stood on capillary matting watered with rainwater. Glasshouse temperatures range from as little as 8C on winter nights to highs of 30C on Summer days. The plant is said to be an easy orchid species to grow and it has certainly survived well with us so far. The tiny flowers of Dendrochilum filiforme showing their nectar spurs. Dendrochilum filiforme was named in 1840 by Lindley in who commemorated its long thread like inflorescences in its botanical name published in Edwards’ Botanical Register in 1840. Lindley was lucky enough to have access to live material on which to base his description. Curiously the plant in Lindley’s description is said to have minute greenish brown flowers whereas the plant generally in cultivation has golden flowers. Whether this indicates the flowers were dying off of whther this was a different colour form will remain the subject of speculation. Platyclinis filiformis (Lindl.) Benth. ex Hemsl., Gardeners’ Chronicle, n.s., 16: 656 (1881). Acoridium filiforme (Lindl.) Rolfe, Orchid Review 12: 220 (1904). Dendrochilum ramosii Ames, Philippine Journal of Science, C 8: 410 (1913 publ. 1914). Dendrochilum filiforme var. ramosii (Ames) L.O.Williams, Botanical Museum Leaflets 5: 49 (1937). Along with many other orchids, this species is of great interest to specialist growers, especially given the tolerance it shows to a range of growing conditions. The epiphytic nature and ability to survive periods of drought give it tolerance to the forgetful gardener. This orchid originates at moderate to high altitudes in the Phillippines on Luzon and the Visayas and the first European material seems to have been collected by Mr Hugh Cuming in Manila. 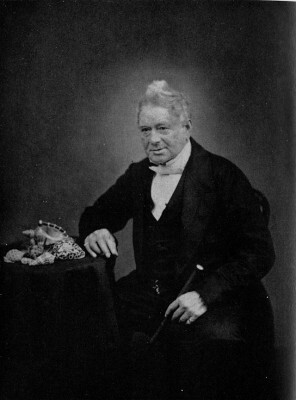 Cuming was an energetic natural history collector who travelled the world in search of new discoveries and was particularly famous for his collections of molluscs (Dance 1980). Lindley, J. 1840. Dendrochilum filiforme. In Edwards’ Botanical Register, 26(Misc. ): 52. This entry was posted in Asia, Philippines, Species and tagged Dendrochilum, Glasshouse orchids, Golden Chain Orchid, Hugh Cuming, John Lindley, Orchids. Bookmark the permalink.